I have a feeling my wife is out to get me. She was all of 39 years old when she decided she didn’t want to be 40. So she punishes me. What is she looking for? I haven’t done anything wrong. Unless she says so. She follows me to the garage, the mailbox, and even down the hall. She tries to follow me into the bathroom. She digs through our closets, under the bed, through my dirty laundry. She calls my mom and talks secretively to her. “What do you think I’ve done?” I finally ask her. I bring up specific instances. She denies it all. I tell her to stop. She says she isn’t doing anything. “But you are,” I say. She says she isn’t doing anything. That’s how arguments go in our house. During Halloween time when I was around 8 years old, I ate so many pumpkin candies I made myself sick. My stomach rejected these pumpkin candies -- more accurately, my stomach projected these pumpkin candies. This happened in church. Needless to say, the people in front of me were less than thrilled. My love for the sweet mellowcreme candy wasn’t immediate. At about age 4, when first introduced to pumpkin candies (small, pumpkin-shaped confections made primarily from corn syrup, honey, wax and sugar, and tasting like candy corn), I didn’t want to eat them. I wanted to draw faces on them and put them up as decorations for Halloween. Then I made the mistake of taking a bite. Yum. But even at such an early age, when the stomach can practically take any dose of candy and not get upset, my stomach hurt after only two or three bags. What made matters worse was I had to have more, the same effect I imagine nicotine has on smokers. During my childhood, my mother would fill up a glass pumpkin jar with pumpkin candies every October. I’d quickly gobble those babies down. 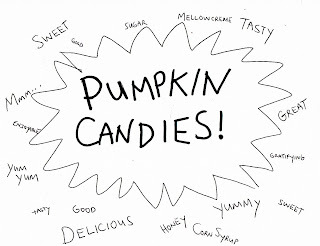 After my churchgoing incident with the pumpkin candies, I learned to manage my pumpkin candy intake. I knew my limit -- sort of. I came close to repeating the church disaster many times, but I have to say, as an adult, I’ve never come close to eating too much. If I stick to one bag every Halloween season, I’ll be fine. I just can’t give them up. Each bite of those candies gives me a rush of Halloween nostalgia. Those childhood days of Halloween are some of the highlights of my life. Halloween, you see, is my favorite time of year. It’s a time of magic, of make-believe, of becoming someone else (or something else). It’s the mystery and excitement of seeing others’ costumes, of seeing how others respond to yours. It’s about giving and getting candy, scaring and getting scared. You laugh, you scream, you run, you dream. You play tricks and get tricked. It’s a heck of a ride. With that first bite of the sweet mellowcreme each year comes a burst of Halloween memories: my earliest experience trick-or-treating without adults, going into inventive haunted house walk-throughs, that one house that might’ve actually been haunted. The second bite of the candy now makes me sick. “Why is this happening?” I asked during the last few Halloween seasons of pumpkin candy consumption. Last year, I considered throwing out my bag of candies after only eating two pieces. My wife, unsupportive as she is, told me I was on the right track. Can you believe that? They’re bad for my stomach, she said, bad for my diet (funny, I don’t have one), bad for my teeth. 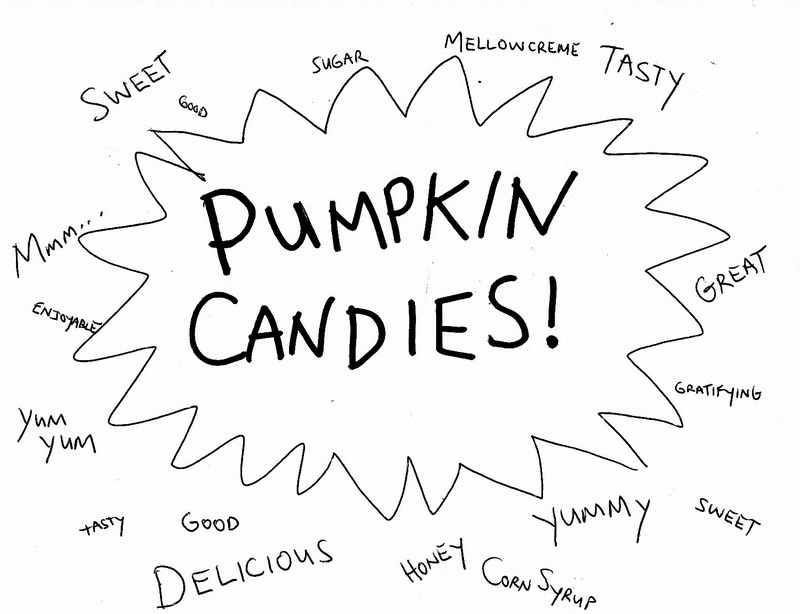 And pumpkin candies are just gross, she added. My wife just doesn’t want me to be happy. I catch my wife at the trashcan with my bag of pumpkin candies. I’m touched to learn of her concern for me. Really. I tell her I don’t need the pumpkin candies anymore, that they make me sick, that the memories are all reruns anyway. But that night, I can’t help it. I sneak out to the trashcan in search of that bag of magic she threw out, not unlike the way Dr. Frankenstein ventured into the graveyard to find a body for his monster. This parallel makes me consider the damage I might cause -- every Frankenstein story I’ve seen ended terribly for Dr. Frankenstein. So I turn around before I open the can to retrieve my candies. I go back to my wife and confess my doings. Ah ha, my wife isn’t out to get me. As she eats from the bag she never threw out, I learn that, all along, she was out to get my pumpkin candies!